The 5th edition of this popular book has been fully updated for PHP 7, including replacing the PEAR package manager with Composer, and new material on Vagrant and PHP standards. It provides a solid grounding in PHP’s support for objects, it builds on this foundation to instill core principles of software design and then covers the tools and practices needed to develop, test and deploy robust code. 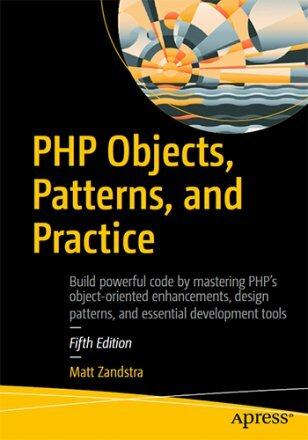 PHP Objects, Patterns, and Practice begins by covering PHP’s object-oriented features. It introduces key topics including class declaration, inheritance, reflection and much more. – Breaks down the principles of object-oriented design, explaining key design patterns using practical examples. – Discusses the tools and practices necessary for developing, testing and deploying exemplary applications. – How to work with object fundamentals: writing classes and methods, instantiating objects, creating powerful class hierarchies using inheritance. – Master advanced object-oriented features, including static methods and properties, managing error conditions with exceptions, and creating abstract classes and interfaces. – Learn about the new object-oriented features introduced by PHP 7 and why they matter for your code. – Understand and use design principles to deploy objects and classes effectively in your projects. – Learn about design patterns, their purpose, structure and the underlying principles that govern them. Discover a set of powerful patterns that you can deploy in your own projects. – Learn about the tools and practices that can guarantee a successful project including unit testing; version control, build, installation and package management; and continuous integration.